Now that Tim Tebow, Sam Bradford and Colt McCoy have left for the NFL, three new quarterbacks are getting ready to take center-stage at Florida (John Brantley), Oklahoma (Landry Jones) and Texas (Garrett Gilbert). So which players will generate the hype on Saturday afternoons this fall? 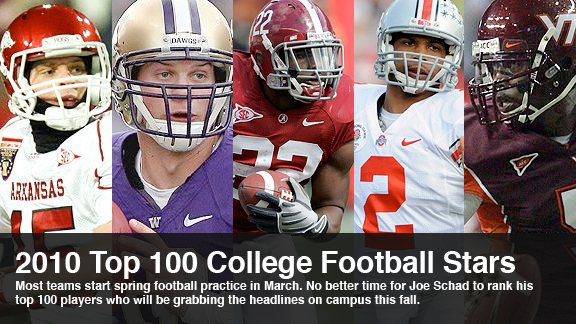 ESPN's Joe Schad ranked the top 100 players whose names you need to know. No surprise, Alabama has 7 of the top 100 players - highlighted by reigning Heisman Trophy winner Mark Ingram (#3) and wide receiver sensation Julio Jones (#8). Landry Jones (#31) and the Oklahoma Sooners have 6 and both Florida and North Carolina have 4 players who cracked the list.